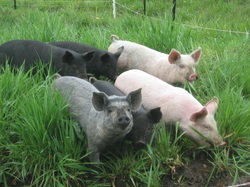 SpringMore Farm pigs are happy and healthy. We move them around the pasture so they always have access to fresh grass. The pigs help keep the brush cleared along stone walls and till our gardens in the spring and fall. They are fed whey from a local cheese maker and spent grains from SILO distillery. All pork is processed at a Certified Humane Handling USDA Facility. Please ask us about reserving a whole or half hog to stock your freezer, or check our our pork packages.